The following walkthrough guide runs through an install, setup, and use scenario for NetApp’s fantastic mbralign tool. The lab used here consists of NetApp 8.1.2 7-Mode Controller (SIM), VMware ESXi 5.1 Host, VMware vCenter Server 5.1, and VMware vSphere 5.1 Client. Here we are running VMs on NFS datastores but the theory applies to FC and iSCSI too. Let’s begin! The software is available from http://support.netapp.com > Downloads > Software > Virtual Storage Console (VSC). And the latest version of the VSC is 4.1 which we use here. This post is about mbralign hence the VSC install is not covered here; for a slightly old blog post that does, please check here! Then click on ‘Virtual Machine Alignment’, click on the ‘Misaligned’ folder, and review the results. Note: The results of the scan can be seen in various places around the vSphere Client and NetApp tab, and the scan can be scheduled. Note: Recommend having mbralign and the VM to be re-aligned on the same ESXi host, this is because mbralign cannot tell power-on status if the VM is on a different host to the one mbralign is being run from. With the mbrtools_esxi.tgz downloaded, we need to get this to the ESXi host, and the easiest way to do this is to upload to an accessible datastore via the vSphere Client. The above navigates to the correct datastore, unpacks the mbrtools, and copies them to /opt/ontap. Note: The VM must be powered off before running mbrscan against the vmdk file. Note i: Before running mbralign, it is not a bad idea to take a SAN snapshot of the datastore/VM folder first. Note ii: Check out the Appendix section below for using the --sparse option if you don’t want mbralign to produce thin-provisioned VMDKs or not make thin one’s thick! WARNING: This version of mbralign is intended for ESXi configurations only … This version does not support Windows drive letter re-mapping. It can only align one vmdk file at a time. Since this program will not check for space before creating a new vmdk file of approximately the same size as the original, always check if enough free space is available in the datastore before running mbralign. The Virtual Machine must be powered off before running mbralign against the vmdk file. A backup file of the vmdk file will be created and stored in the datastore alignment occurs in. If an error occurs, manually restore the vmdk file with the backup. NOTICE: This tool does not check for the existence of Virtual Machine snapshots or linked clones. The use of this tool on a vmdk file that has a snapshot or linked clone associated with it can result in unrecoverable data loss and/or data corruption. Working on partition P1 (3): Starting to migrate blocks from 32256 to 32768. Working on space not in any partition: Starting to migrate blocks. 100.00 percent complete. 100.00 percent written. .
7. Power up the re-aligned VM! Then power on the VM and check all is okay. Note: There are additional steps that need to be done with Linux VMs as mbralign messes up the grub boot loader. Delete these files when they’re no longer needed. Use the sparse option for mbralign to create a thin provisioned VMDK. Note: See here for a discussion on the --spare option not working (making all aligned vmdk’s thick) with the NFS CopyOffload option enabled. If the mbralign process didn’t work out, simply run mbralign again to restore the original. The restore process is very quick! Error: A backup file named ./WIN2K3_32BIT_MS_03-flat.vmdk-mbralign-backup was found. This may be from a failed realign. Please remove or rename all files ending in -mbralign-backup. Note i: This process also removes the -mbralign-backup files. Note ii: If you accidentally turn a thin VMDK into a thick one, the mbralign restore brings back the thin one! 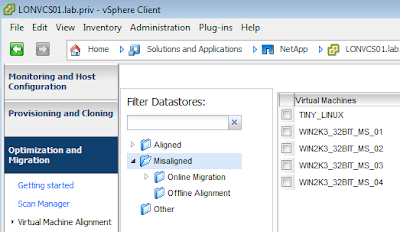 I came across this tip at http://www.deucedaily.org/blog/2012/03/19/speed-up-mbralign/ regards using a Linux management server to mount the NFS datastore with the VMDK to be aligned in, and running mbralign from the Linux management server. Not tried it, but if you’re finding mbralign slow, it might be worth a crack!